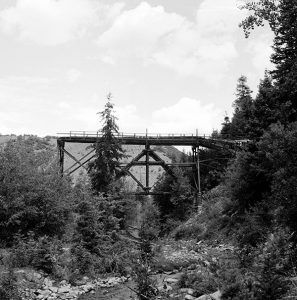 The Sweet Coal Company was located just southwest of the mining camp of National and was developed about the same time as Consumers by William Sweet, who secured a lease on the land. Originally called the Gordon Creek Coal company, it was changed to the Sweet Coal Company in 1925. 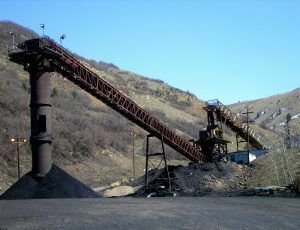 Coal operations produced about 500 tons each day and shipments began from the Sweet mine in January 1926. The camp that grew up around it took the name of its owner and consisted primarily of tents. However, as the coal flourished, the tents were replaced with permanent buildings and the population grew to about 200 people. The three mining camps of Sweet, National, and Consumers shared the National post office and school house and Consumer’s hospital and amusement hall. Each camp had its own store and water well. The mine temporarily closed in 1937 but reopened during World War II, only to fall into receivership in March 1940. In March 1941 it was taken over by the Judson Coal Company who once again began production and the following year, bought out all its assets. It continued to be worked until the early 1950s. Mining in the area along Consumers Road today has wiped out the remains of the mining camps that were once situated here. By Kathy Weiser-Alexander. The townsite was located just beyond National at a point where Consumers Road splits, and then about .3 miles on the left fork. The only thing left is a large foundation.